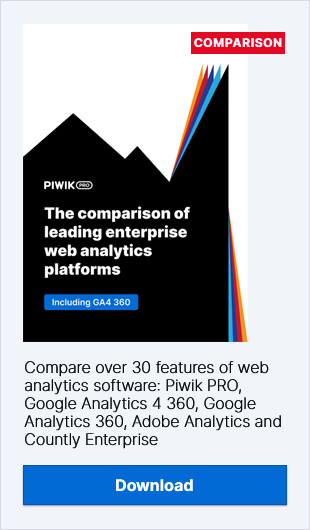 We’re happy to announce that new pricing plans are available for Piwik PRO Analytics Suite. The changes will allow small and medium enterprises to take advantage of affordable privacy-compliant marketing tools (including Consent Manager) to meet the requirements of the GDPR. In recent weeks, one of the most restrictive data privacy regulations the world has ever seen came into force – we’re obviously talking about GDPR. Now every company that processes the personal data of EU citizens has to make sure that their internal processes, services and products are in line with the provisions of the new law (we wrote about it in numerous articles on our blog, be sure to check them out). Otherwise, they risk severe fines. Among many other things, they have to collect active consents from visitors before they start processing their data. The new rules apply not only to large corporations, but also to small and medium-sized enterprises. The reason for the worry for many of them is the fact that the most popular freemium analytics software provider decided to limit their support in that matter to the bare minimum. Although Google introduced some product updates that aim to help their clients comply with the new regulation (like data retention control and a user deletion tool), they decided that their clients (data controllers) are the ones who have to develop their own mechanism for collecting, managing, and storing consents (via opt-in) from visitors (for both Google Analytics and Google Tag Manager). Following all these rules can be a hassle for website owners, especially small to medium enterprises with often limited resources of time and workforce. Important note! Recent events indicate that Google could be an unreliable partner in the face of the new EU regulations. On the first day after the regulation came into force, Google was sued for violating provisions of GDPR by Max Schrems an Austrian lawyer and privacy activist. You can read about it more in this article by Verge. Luckily, there are many vendors who decided to create a tool to mediate between visitors and analytics software. Depending on the provider, it’s called Cookie Consent Manager, Cookie Widget, GDPR Consent Manager, etc. These tools are a kind of gatekeeper that passes information about consents between individual visitors and your analytics system. That way, you make sure that the data you’re operating on has been collected in compliance with the new law. One of the companies developing this type of product is Piwik PRO. You can read more about our solution here. Due to the growing interest in our GDPR Consent Manager among small and medium enterprises, we decided to prepare a special offer tailored to their needs. All companies wanting to collect data about the behavior of their website’s visitors in a privacy-compliant manner, will be able to take advantage of the new Business Plan” pricing package. The offer is intended for businesses with up 2 million monthly actions on their websites. The combined forces of these products will help you collect all the relevant information about visitors without violating the provisions of the new law (and also other data privacy laws including Chinese Internet Law and Russian law 526-FZ). Sound interesting? Then give it a (free) spin! All you have to do is register for 30-day free trial. Our sales representatives will contact you within 24 hours! You also can read more about the offer on our pricing page.